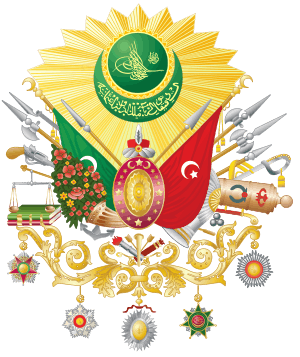 The First Constitutional Era (Ottoman Turkish: مشروطيت‎; Turkish: Birinci Meşrutiyet) of the Ottoman Empire was the period of constitutional monarchy from the promulgation of the Kanûn-ı Esâsî (meaning "Basic Law" or "Fundamental Law" in Ottoman Turkish), written by members of the Young Ottomans, on 23 November 1876 until 13 February 1878. The era ended with the suspension of the Ottoman parliament and the constitution by sultan Abdülhamid II, with which he restored his own absolute monarchy. The elections for parliament were held in accordance with the provisional electoral regulations. 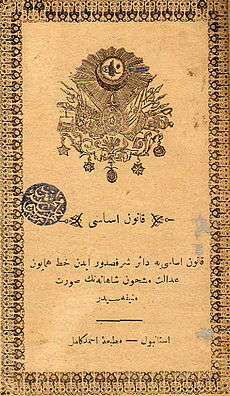 The parliament (General Assembly of the Ottoman Empire; Ottoman Turkish: Meclis-i Umumi‎) was composed in two stages. The lower house of the bicameral legislature was the Chamber of Deputies (Ottoman Turkish: Meclis-i Mebusan‎), while the upper house was the Senate (Ottoman Turkish: Heyet-i Ayan‎). The initial selection of deputies was made by administrative councils in the provinces (also called "Meclis-i Umumi"). 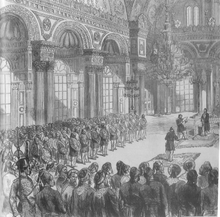 The members' reactions to the approaching war were very strong, and sultan Abdülhamid II asked for new elections citing the Russo-Turkish War (1877–1878). The life of the second term of the parliament was merely a few days, as after the initial speeches by the members from Balkan vilayets, Abdülhamid II closed the parliament, citing social unrest.